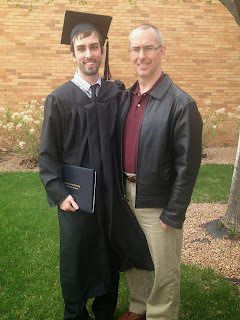 Amy's Creative Pursuits: Happy Graduation: Your Free! 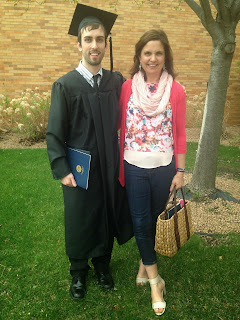 This past weekend we had another wonderful weekend celebrating our son's college graduation. Jordan received his Bachelor's of Arts degree in Music Performance (Percussion). Since he was on the five year plan, he was SO ready to graduate from school and was literally counting the days. Even though I've been on a stamp buying freeze, when I saw this new graduation image by Penny Black I had to buy it because I thought it would be perfect for him. The name of the stamp set is 'For the Grad', but I used additional images from Inkadinkadoo's 'Birds Galore'. The pretty designer paper is 'Fairy Flora' by Prima and black and kraft. Because the card is for a guy, I kept it very clean and simple and only added a simple black ribbon for embellishment. 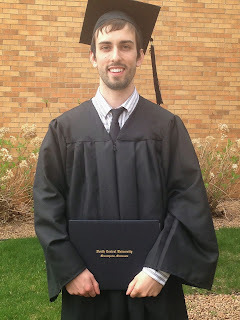 And now, here are some graduation photos, sorry for the bad pictures. I didn't take my big, fancy camera because I think my IPhone takes just as good pictures, but for some reason they are very grainy. I probably just needed to cleanse the lens. Jordan with my husband Todd. And the star of the day! If you'd like to hear Jordan play, we've been busy uploading some of his performances onto YouTube. The first video he performed in the U.W.E.C. Jazz Festival with one of his college groups. Jordan wrote the offbeat drum music towards the end of the song himself. We are so proud of Jordan for how hard he has worked developing his musicianship and also for the wonderful, Christian man he has become. If your wondering what his future plans are, for now he will be home for the summer working at his old, summer job, but he plans on moving to an urban area in August. I'm not free to share anything more than that at this time, but I promise I will be doing a big post/announcement on that when the time gets closer. Congratulations again to your son! Wishing him all the best for his future! Love the card, the bird and cage images are so perfect for a graduation card. Oh superb card, fab for the theme ! Congrats to Jordan !